Early summer is a great time to visit the Ffestiniog and Welsh Highland Railways in Snowdonia. Whether you’re a fully blown garden lover or simply fond of appreciating stunning scenery, the abundance of flora and fauna on show – together with the longer days – will ensure there is plenty to delight you. Our two railways run through some of the most beautiful parts of the National Park, with ever-changing scenery as the trains pass though farmland, woods and valleys on their journey from coast to mountains. You’ll find many places to explore along the way so why not treat yourself to a mini break and make the most of the summer sunshine? Some of North Wales’ most charming gardens have come together for a new festival this month. We are lucky enough to have the most amazing microclimates here and, with the effect of the Gulf Stream, we have plants from all over the world surviving happily next to our own native species. Not enough has been said about these beautiful gardens; until now that is. Respected garden expert, Tony Russell, moved to Snowdonia a couple of years ago. When he realised that not enough people were aware of the quality on offer, he quickly got to work with North Wales Tourism putting together this inaugural festival which, we are sure, is set to become an annual event. Whilst the festival only runs for nine days, most of the gardens are open throughout the summer. To find out more about specific gardens, visit Gardens North Wales. For the garden lovers amongst you, there are plenty to choose from within a short distance of the railways. 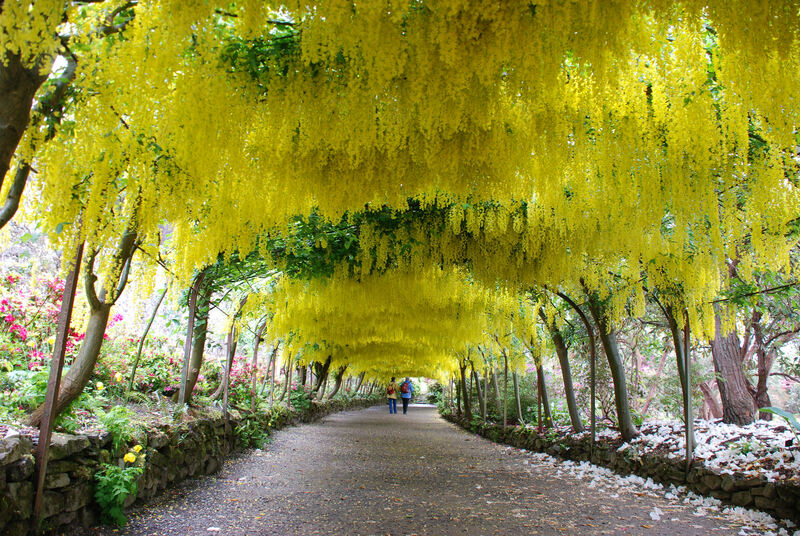 The weird and wonderful world of Portmeirion is only a mile away, while Sir Clough Williams Ellis’ own gardens of Plas Brondanw offer a different insight into this fascinating man. Why not combine a trip on the Ffestiniog Railway with a visit to Plas Tan y Bwlch; study centre for the Snowdonia National Park and once home to the Oakley family? The Oakleys were quarry owners at a time when slate was in high demand making them instrumental in the building of the railway. Both the house and garden highlight the influence these wealthy Victorian families had. 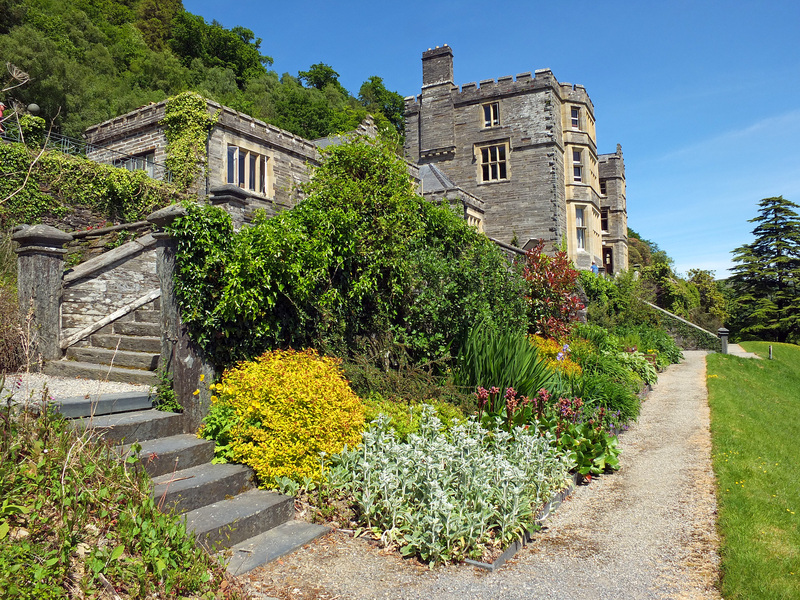 Plas Tan y Bwlch gardens contain some interesting species from the great plant hunters of the 19th Century and even went so far as to move the river in order to improve the view from the terrace. Fancy a woodland walk through the historic woods of the Vale of Ffestiniog? Visit Tan y Bwlch station and meander down to the house and gardens to enjoy a spot of lunch in the pretty tea room on the terrace whilst overlooking the lawn. The railways themselves boast some beautiful gardens at many of their stations; Minffordd being of particular note. All are lovingly cared for by our staff and volunteers – even though the local sheep view them as a handy place to eat! 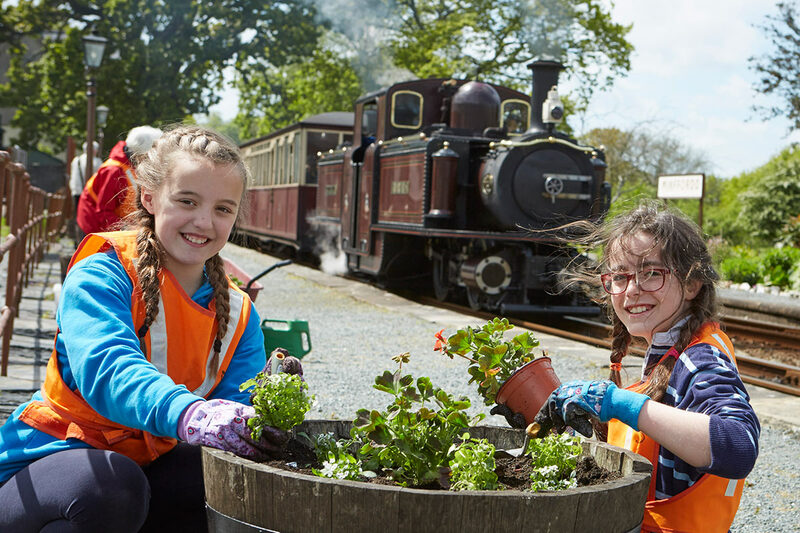 Ensuring the stations stay smart and bright throughout the year might seem like a labour of love but, in fact, it is a chance for volunteers to come together and share their love of gardening whilst simultaneously helping make the railway a place to be proud of. And once you’ve finished exploring all the stunning gardens in this local area, sit back on the train, relax with a glass of local brew or a warming cup of tea, and simply enjoy Snowdonia at its best.